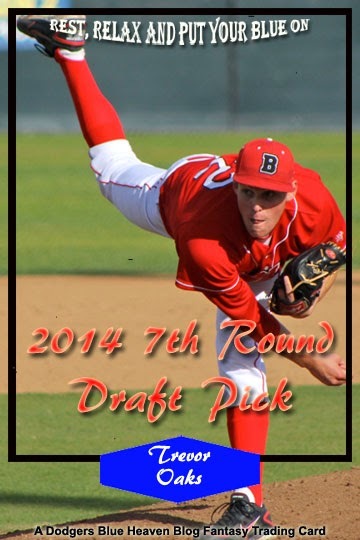 The Dodgers passed along a press release announcing their first 10 picks from the 2014 amateur Baseball Draft. They provided a brief description of each player. Check it out below. I also included some brand new fantasy cards and twitter comments. Click on any pic to embiggen. The Dodgers today announced their selections from the first two days of the 2014 First-Year Player Draft. Los Angeles made eight picks today after drafting Conway High School (SC) right-hander Grant Holmes (Twitter - @GHolmes_14) with the 22nd overall selection and Sahuaro High School (AZ) outfielder Alex Verdugo with the 62nd overall selection in the second round yesterday. Through the first two days of the draft, the Dodgers selected six right-handed pitchers, two outfielders, one infielder and one catcher. The club used seven picks on college players and three picks on high school prospects. 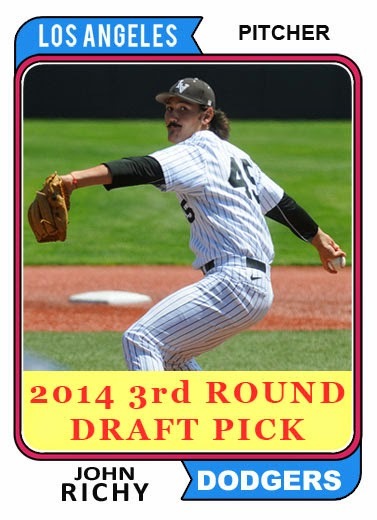 With their first pick on the draft's second day, Los Angeles selected right-handed pitcher John Richy (Twitter - @jrichy45) out of the University of Nevada, Las Vegas. The 6-foot-4, 210-pounder went 11-4 with a 3.20 ERA (43 ER/121.0 IP) and 113 strikeouts in 16 starts for the Rebels this season. As a junior this season, Richy led the Mountain West Conference in innings, strikeouts, wins, starts, and also registered five complete games. In his career at UNLV, the 21-year-old has posted a 3.38 strikeout-to-walk ratio (189 K/56 BB). 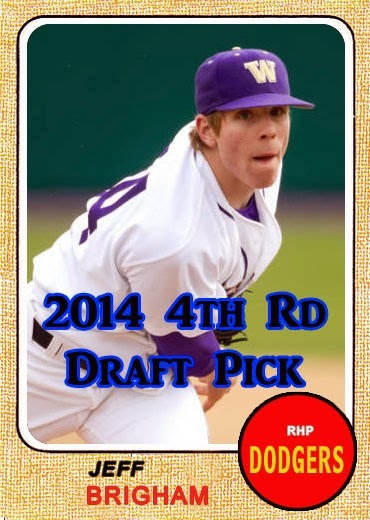 The Dodgers selected their third pitcher of the draft in University of Washington (WA) pitcher Jeff Brigham (Twitter - @jbrigs34) with their fourth-round pick. Brigham finished the 2014 season going 7-4 with a 2.90 ERA (29 ER/90.0 IP) in 16 starts, giving up one run or less in six of his starts with a total of eight quality starts on the season. The 22-year-old junior from Federal Way, WA is listed at 6-foot, 198-pounds and earned Honorable Mention All-Pac-12 and First Team All-Academic honors. 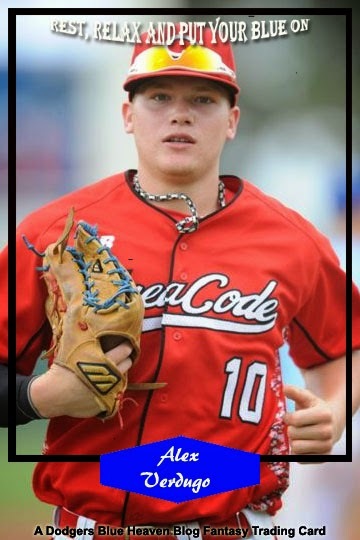 In the fifth round, Los Angeles selected McEachern High School (GA) third baseman Jared Walker (Twitter - @JRod_Walker), the first infielder the Dodgers selected in the draft. Walker, 18, batted .466 with a 1.253 OPS in 31 games for the Indians, amassing three homers, 30 RBI, and 22 stolen bases in his senior campaign. The Dodgers picked right-handed pitcher Brock Stewart (Twitter - @B_Rock_one5) out of Illinois State University (IL) with their sixth-round selection after the 22-year-old went with 3-2 with a 2.36 ERA in 11 games (one start) this season. Stewart, who is listed at 6-foot-3, 210 pounds, also appeared in 120 games as an infielder during his four-year playing career with the Redbirds, batting .266 with a .343 on-base percentage. 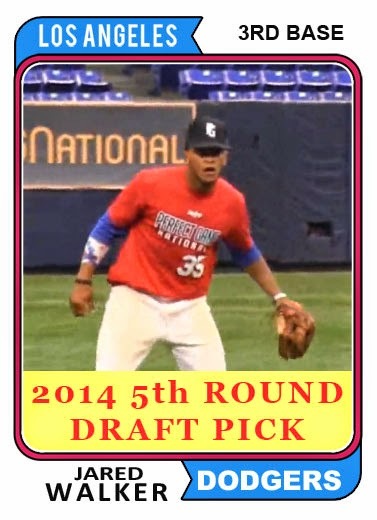 The redshirt junior, who is the son of San Diego scout Jeff Stewart, was previously drafted by the Mets in the 40th round of the 2010 First-Year Player draft out of Normal West High School (IL), but did not sign. Indescribable feeling!! So happy to be a Los Angeles Dodger!! Now It's time to get to work! In the seventh round, Los Angeles selected its fifth right-handed pitcher in California Baptist University hurler Trevor Oaks (Twitter - @trevoaks), who posted a perfect 11-0 record with a 1.68 ERA (20 ER/107.0 IP) in 15 starts for the Lancers. The 6-foot-3, 220-pounder earned All-American honors in the NCBWA in addition to winning the PacWest Pitcher of the Year after leading the league in wins, strikeouts (107), ERA and shutouts (2). 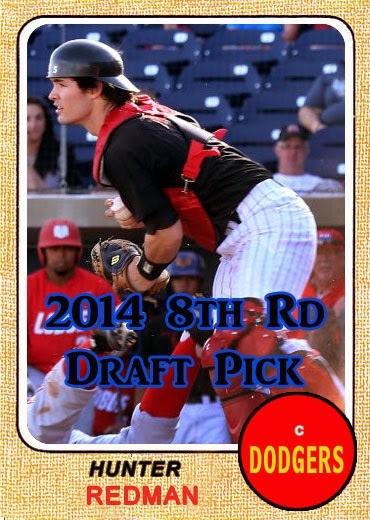 The Dodgers selected catcher Hunter Redman (Twitter - @HunterRedman1) out of Texas Tech (TX) in the eighth round. On the year, the 5-foot-11, 195-pounder is batting .252 with 17 RBI in 42 games for the Red Raiders, who are set to face College of Charleston in the three-game set at the NCAA Super Regionals this weekend. Before transferring to Texas Tech, the 21-year-old played in four games for the University of Texas (TX) in 2012 and 52 games for Midland College (TX) in 2013. Redman's brother, Reid, is a pitcher in the Marlins' organizations and was a 37th-round selection of the Dodgers in the 2010 First-Year Player Draft, but did not sign. 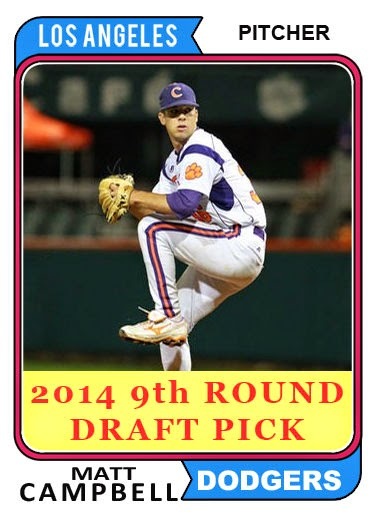 In the ninth round, the Dodgers picked Clemson (SC) right-handed pitcher Matt Campbell (Twitter - @MattyIce36). In his senior season for the Tigers, the 22-year old allowed only three earned runs in 32.0 innings (0.84 ERA), while registering eight saves with 45 strikeouts against 15 walks. In his career at Clemson, the three-time All-ACC Academic selection amassed 19 saves with a 2.75 ERA (33 ER/108.0 IP), while posting an 11.17 strikeouts-per-nine-innings ratio in 78 career relief appearances. Couldn't be more humbled and honored for the opportunity the @Dodgers have given me! Thank you everyone who has helped me get to where I am! 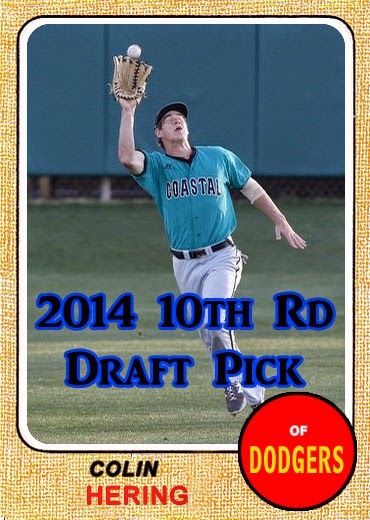 Los Angeles' last selection on the second day of the 2014 First-Year Player Draft was Coastal Carolina (SC) outfielder Colin Hering (Twitter - @shooting_gaps24). In two years at Coastal Carolina, the left-handed hitting Hering posted a .350 on-base percentage with 17 stolen bases in 113 games. In his two years prior to transferring to Coastal Carolina, the 23-year-old played two seasons at Bellevue College (WA), leading the NWAACC with 39 RBI his sophomore year and was the NWAACC runner-up for North Region MVP. So, did the Dodgers get the message? Well, one win doesn't make the grade. Ask me that quesyions a couple weeks down the road. 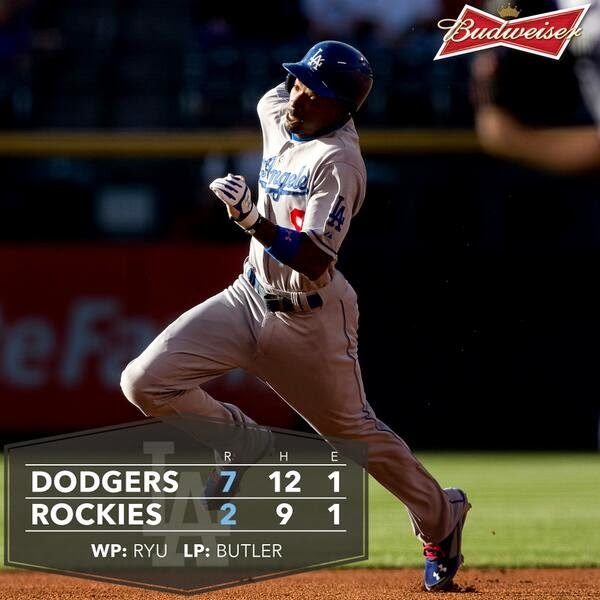 Graphic above via @Dodgers on twitter. 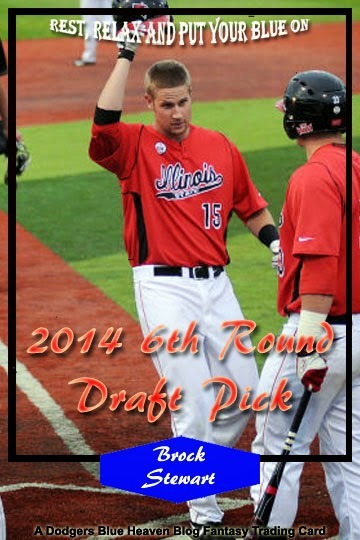 Chad Moriyama at Dodgers Digest tells us all about the Dodger draft picks from #6 to #10 who were chosen yesterday. Via Dylan Hernandez at the LA Times, " Dodgers Adrian Gonzalez, Matt Kemp agree with Don Mattingly's criticism." Kemp also didn’t dispute Mattingly’s description of the team. Rojas has been on a power surge of late, with all four of his home runs coming during his active eight-game hitting streak (.412, 14-for-34) that preceded his call-up. 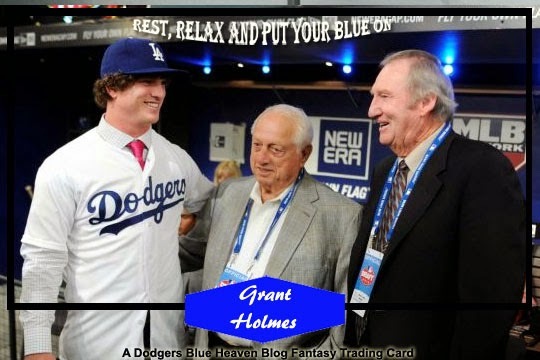 JP Hoornstra at Inside the Dodgers put up an interview with Dodgers 2014 1st Round Draft pick Grant Holmes - he tells us he learned his top-ranked curveball from the most unlikeliest of places - YouTube. Left Field Pavilion creates a couple of great graphics for potential All-Star Game selections Yasiel Puig and Dee Gordon. Go here to check out his awesome Zack Greinke graphic, as well. Via Bill Shaikin at the LA Times, "Dodgers prospect Alex Guerrero's repaired ear is on the mend." Doctors have detected circulation and growth in the surgically reattached portion of Alex Guerrero's left ear, increasing the chances that the ear can be saved, according to his agent, Scott Boras. This is just plain dumb, and I would argue wrong. Check out this article by Harrison Mooney at Puck Daddy about a Hermosa Beach restaurant that briefly had a little taunt/chirp at Kings fans expense (the place bills itself as a Chicago restaurant) after they defeated the 'Hawks, so Kings fans with thin skin went on Yelp to trash the place - and ultimately try to hurt their livelihood. Stop it, please! There's nothing wrong with chirping. It's allowed in sports. Heck, this sports fan even respects a good taunt. So please, stop feeling hurt and start being happy about the Kings being in the Finals! Via his instagram, Yasiel Puig saw snow for the first time.